The band draws its influence from such artists as Rage Against the Machine, Queens of the Stone Age, Pearl Jam and Red Hot Chili Peppers. It's clear to see from their powerful live sets that they hold viscerally expressive vocals, atmospheric and foreboding guitar swells and shadowy rhythmic undertones high on their priorities when it comes to songwriting. 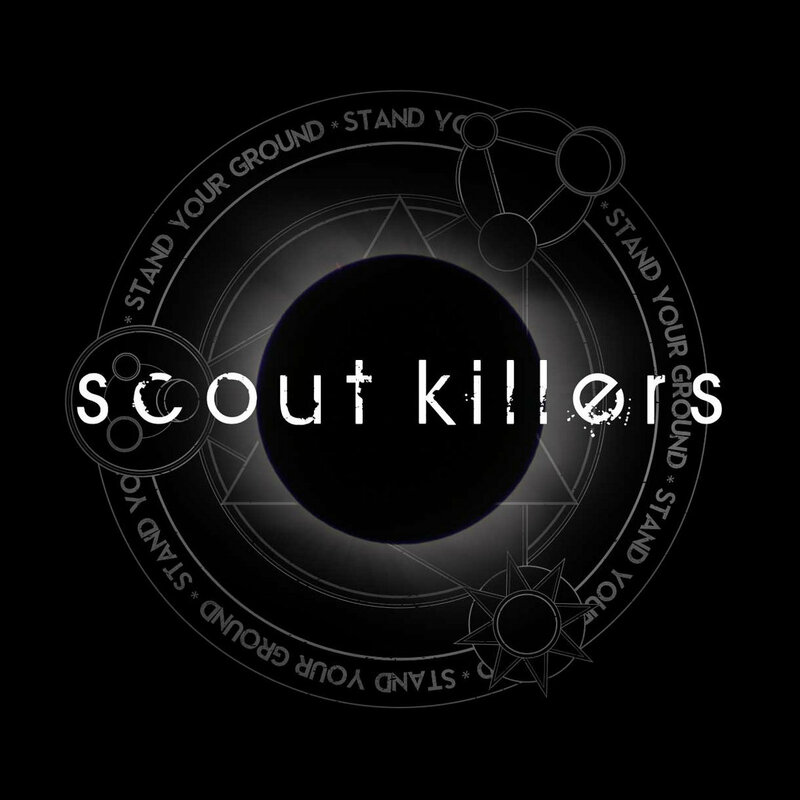 With so much quality throughout Stand Your Ground, Honey is perhaps the most ‘traditional’ Scout Killers track- that would remind you of their early work. Uniting their sapling sounds with more up-to-date influence/inspiration, the boys start with a huge kick. Earthy and sensual; pounding and primal, the sparse beats (that welcome the song in) are an early declaration- the potency and passion is stunning. Controlled and emotive, the band manages to whip-up infant fascination- with as few notes as possible. Yearning (guitar) strings melt with syncopated beats; reminding me of In Rainbows-era Radiohead- sensational cuts like Weird Fishes/Arpeggi and All I Need- the song remains controlled and firm whilst showcasing a real ear for emotional build. Perhaps the Radiohead comparisons are apt- little flecks and moments put me in mind of their finest moments- yet it is the band themselves that shout loudest- a very distinct product of Scout Killers. Swooning and floating; toe-tipping and serene, it is impossible (not to) get caught up in the introduction- it is one of the most perfectly-formed I have heard this year. After the majestic opening, the song starts to crank up; the vocal comes in- initial words look bedroom scenes (lights on; blinds should be closed- questions about fatherly love). Within a few lines- where our hero looks at an ingénue and distinct central figure- the song begins its mystique. In my mind, I was looking at a lonesome teen (female); someone who maybe is shallow and free from respect- maybe pushed away by her friends. The music video (on YouTube) sees a gorgeous young ballerina apply lip-stick; with a vacant stare, she is the embodiment of the song. Caught up in the rip-tide, the listener is powerless to escape- picture the scenes and imagery. With its accompanying video- that reminds me of Wild Beasts’ Albatross; shows the young star pirouette and dance alone; dazzle in the light- it perfectly soundtracks the song- helps to get behind the song’s meaning. The band keeps things level and focused; the composition trips and delicately plucks- the vocal is whispery and romantic; filled with passion and potency. Whoever the subject is- whether a former sweetheart or friend- you look at the song in two minds- caught between sympathy and a sense of condemnation. Our hero advises warning and caution- “look at only your mistakes”- and there seems piecemeal empathy. Whilst the verse progresses, things become clearer- the verse looks at a romantic partner; someone who has come crawling back (to our lead)- and light is shed. Many songs look at similar themes- a former love comes back for more; causes much heartache and worry- yet Scout Killers find a new spin; do not make the song too heavy and accusatory- there is an underlying sense of forgiveness and tolerance. Couple a griping and swooning vocal; a rich and engaging composition, and there is scant vitriol- making the song more three-dimensional and loveable. By the chorus, the composition becomes harder and granite- Grunge shades of Ten-era Pearl Jam- as our lead lets his voice soar. The band does not stray too far from a tried-and-tested presentation- in terms of the compositional elements and structure- but this works in their favour. They do not wander or needlessly divert; instead keep the song focused and tight- instead adding ounces of beauty and grace. A perfect soundtrack- for either your summertime festival throngs or late-night moonlight drives- the song soothes the sense and spikes the brain- the track is both gentile and forceful. By the midway point, the composition starts to change a little: the percussion becomes more prominent; the vocal more determined and soulful. Our hero looks at his girl; the ambitions and dreams she had; what she wanted to be- the sense she has wasted time and clung on to a life raft too long. By the second introduction of the chorus, the scene becomes heavier still- the composition gets fiercer and the sense of anger more evident. Mixing traditional Alternative shades with bespoke Scout Killers qualities- their ear for compositional dynamics and emotional deployment. Essentially, the band knows when to hit it hard; how to get the biggest reactions from the music- how to build a song up. Before the track is through, the band let the composition into the spotlight. The guitars start to chug and sway- like a huge wave crashing the rock- those Grunge/Alternative shades become more persistent (and replace earlier calm and tenderness). Combining with the chorus, the guys rise ever higher- the vocal is at its most tortured here. Straining and roaring, our lead reaches for the heavens (or perhaps Hell I guess) as the song comes to its conclusion- and leaves the listener with questions. Wondering whether issues were resolved- whether our hero will repeat patterns of the past; his girl will figure out what to do- there is that sense of mystery. Whilst not their finest track, Honey is a perfect example of their modern work: it shows how far they have come; what confidence and quality they have at their disposal- a band that deserves a huge following. Each member (of the band) turns in an exceptional performance. Since 2009- when the band recruited its ranks from the Bristol and Bath area- the guys have become stronger and more confident. Their Cage the Storm E.P. - forgot to mention it early; essentially a natural playmate of their debut album- was a terrific effort; their current work is their strongest. Scott Cox’s lead vocal is very much his own: there are shades of Eddie Veder and such- yet nothing too obvious or scene-stealing. His voice has developed and matured- since the earliest days- and his sense of passion and urgency is at its peak. Capable of ranging from an impassioned coo- in the early stages/verses- to a blood-curdling assault—the latter moments- it is a stunning performance. Cox very much takes you inside the song; grips the imagination and senses- his aching tones come across as completely genuine and true. Julien Morez (“Zombie Beast Man”- must be a family name) and Beau Stevens unite their guitars. Covering a huge amount of ground- from gentle and plaintive lows to enraptured highs- they showcase a huge amount of talent and skill. Very much unique players, the duo conspire with a sense of unity and intuition- neither player steps on the other; they fuse their guitars to create a fantastic thing. Josh Ellis’ bass guides the song forward; it is the heartbeat of Honey that guides the song forward. With his unique voice- he fills the song’s spaces superbly; creates a distinct sense of identity and rhythm- his bass fits wonderfully with the band. Seamlessly fitting in the fold, the bass work supports the percussion; emphasises the mood of the song- elevates the composition hugely. The percussion work (from Chris Phillips) is exceptional throughout. In the early stages, he elicits punchy beats: acts as an accelerated heartbeat; maybe a strike of anxiety- he manages to create a sense of atmosphere and (building tension) with a single beat. As the song develops, his drum becomes faster and more empassioned- towards the end it is a firestorm of passion. Never pushed to the back- his beats, at times, are right at the forefront- he perfectly supports the band; keeps things tight and controlled- whilst proving what an essential player he is. The entire band are tight and in-step throughout; the track is a natural evolution from the band- they show just what a tantilising prospect they are. Combining mainstream qualities with underground grit, Honey is a song at home on the airwaves (Absolute Radio and XFM) as it is at small (and sweaty) clubs. It has sweeping emotion and a desire to be loved; a sense of rebellion and plenty of anger- all the things you want from a song.